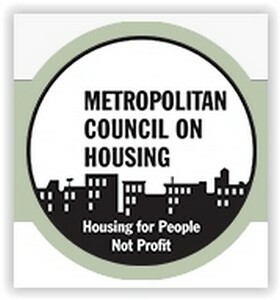 The Metropolitan Council on Housing is a tenants’ rights membership organization made up of New York City tenants who believe in our motto of “housing for people, not profit.” We formed over 50 years ago to fight for a city where everyone has access to safe, decent, affordable housing. To these ends, we organize tenants to stand up not only for their individual rights, but also for changes to our housing policies. We operate a number of tenant-assistance programs, run by our members, including a tenants’ rights telephone hotline and a walk-in clinic, which serve thousands per year and are free and open to any New York City tenant. We publish the city’s only monthly newspaper on the tenant movement, and produce a weekly radio show on housing issues. Our work is not only carried out by members – nearly all of our funding comes from dues and donations of people like you who believe in what we do. Please become a member or make a donation today.